Blogging has taken the Internet by storm and because competition is so tough readers are sometimes hard to please. You must deliver both content and design wise if you want to make it in this niche. Creating a food and cooking website without any previous coding knowledge used to be a daunting task, but not anymore. Nowadays, WordPress provides anyone with an incredible platform to building any type of websites, and WordPress themes are the perfect solution to crafting beautiful websites in a short period of time. 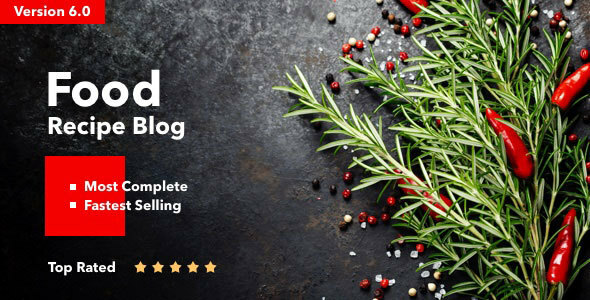 Check out our amazing and complete list with the top 30 best food WordPress themes for cooking and recipe blogs. 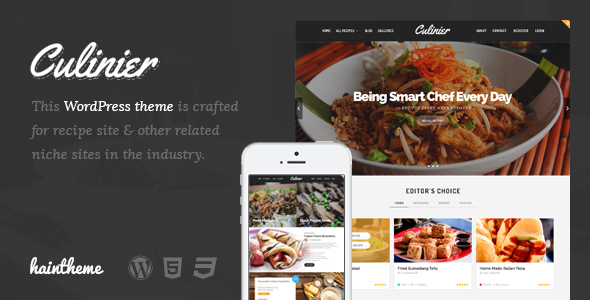 Culinier is a fresh, simple, premium responsive WordPres theme. This theme was designed for cooking blogs or any other food related website. Culinier comes with 3 awesome homepage demos, 2 slider styles, and 2 navigation styles which you can combine to create something unique and stunning. You can add recipes either through the back end of the front, and you get to choose between two layouts: boxed or full width. The theme includes a ton of shortcodes and an easy to use page builder. Chow is a flexible, responsive, modern, colorful premium food and recipes WordPress theme. Chow includes an amazing documentation very helpful when you get stuck, and a live previewer to check out the theme before making the purchase. Chow has a fully responsive layout adaptable to all screen sizes and devices. Some of this theme’s features and tools are the recipe editor, recipe submission, user panel, review system, and a bunch of useful shortcodes. Explore all the possibilities of Chow today! Bella is a stunning, modern, creative, robust, premium WordPress theme created specifically for food websites. This incredible theme comes with an impressive layout that is fully responsive and retina ready. With Bella, your website will look beautiful on all devices. Bella allows you to change the menu design, add reservation forms, translate it in any language thanks to the included WPML, and create multi-column portfolio layouts. It has even more amazing features, but I recommend discovering them yourself by checking out their page and live preview. 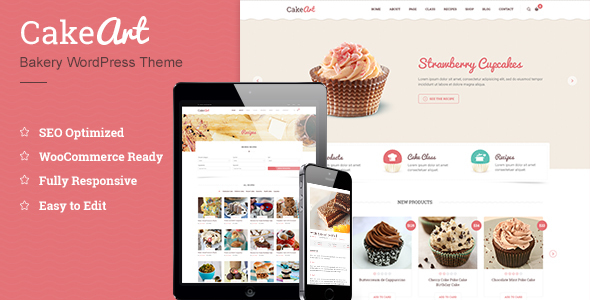 Cake art is a cute, warm, attractive, visually stimulating, modern food WordPress theme. This theme has been built to be the perfect framework for multiple cases and scenarios, all related to food. With a top of the line fully responsive design and layout, Cake art is certainly a great fit for food related projects, business, and blogs. Cake art provides a bunch of features including Revolution slider, awesome parallax effect, a powerful drag and drop page builder, one page option, unlimited skins and colors, RTL support, and SEO optimization. With this theme, your imagination will know no limits. 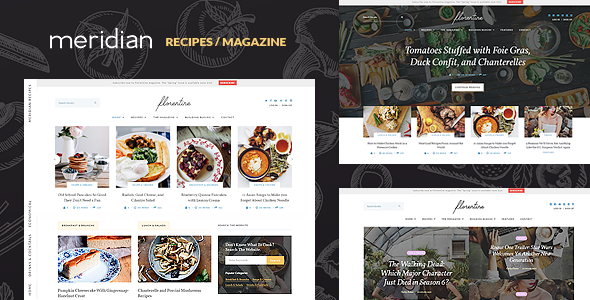 Florentine is a flexible, incredible, mesmerizing WordPress responsive theme, perfectly adaptable to any type of blog websites, but ideal for food related ones. Florentine has an impressive ability to showcase your images and content in a modern and memorable way. Florentine is a feature packed theme that includes 19 unique modules, social media integration, unlimited color options, newsletter popup, an awesome cooking mode, rating system, bookmark option, and a print button. With Florentine you will create a long lasting impression for all your visitors. Delice is an ideal solution for professional and amateur cooks who dream of crafting their own website where to share their experience and recipes. Delice is an exemplary theme, designed and developed to perfection by Bogoiskatel. Delice offers a multitude of features such as rich snippets, a modern rustic layout, 96 custom icons, unlimited colors, a stunning slider, full integration with WooCommerce, and a completely responsive and retina ready design. As your website grows, Delice will be there for you to make it easier and improve your overall experience. 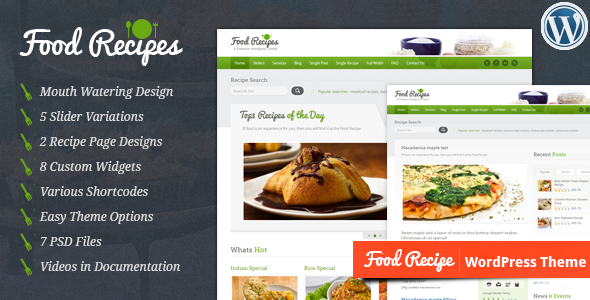 Food & Cook is a competent, creative, appealing, and responsive food WordPress theme. Food & Cook is the ideal platform for cooking blog because it offers a unique and sophisticated design as well as easy to use, potent theme features. Food & Cook is perfect for creating stylish page layouts thanks to its large collection of tools and features. You get 11 already built page layouts, video support, recipe submission form, Revolution slider, WooCommerce integration, and unlimited color options. Try it and see for yourself! 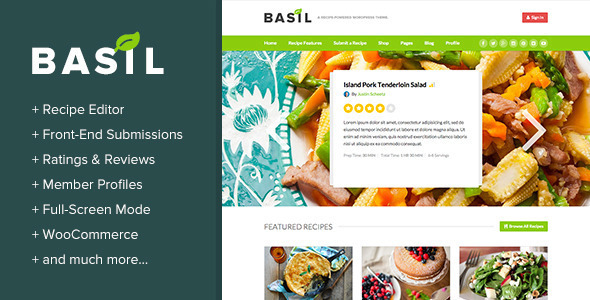 Basil is great, powerful, well-designed, clean, and responsive WordPress theme. It has impressive features like a recipe editor, front-end submissions, rating and review system, member profiles, and a few others. Basil is compatible with WooCommerce which gives you even more flexibility to create the perfect website for you. Basil also comes with a premium plugin, Cooked, for free. This theme’s recipe slider is a unique addition and highly engaging one capable of grabbing the attention of visitors. With these being said, why wait? Get Basil! 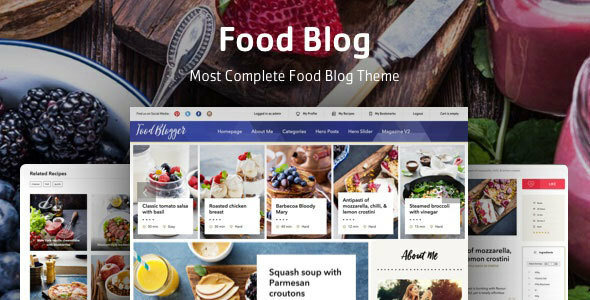 If your goal is to have a successful food blog for sharing recipes, then this theme is perfect for you. Food recipes comes with a beautiful design and awesome various functions to make your life easier. Food recipes’ theme features are centered towards food related websites, for instance you have options such as front end recipe submit form, a recipes listing page, recipes details, specific custom widgets, and much more. This theme also comes with a fully responsive design, video support, 5 slider options, and 4 skin styles. 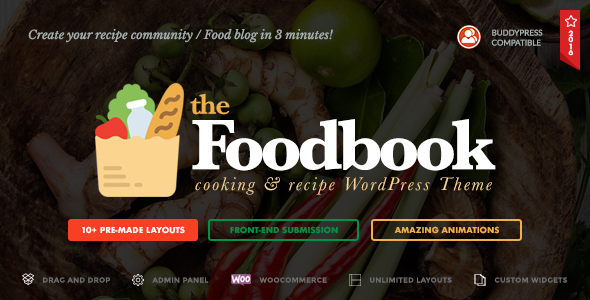 Food blog is an attractive, complex, stylish, and eye-catching food WordPress theme. It was designed to serve as an ideal platform for cooking, food, and recipe blogs and is fully responsive and adaptable to all devices. 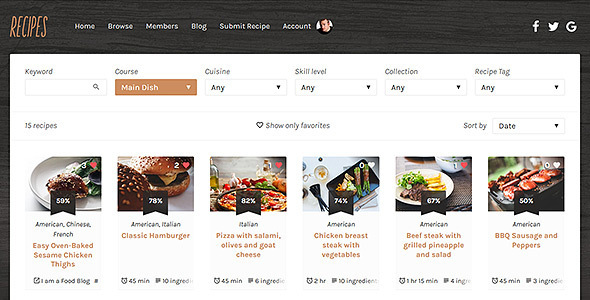 With this theme you can provide your users with a way of adding recipes, but not without your approval first. It also offers a simple and useful way of adding ingredients, as well as nutritional data. 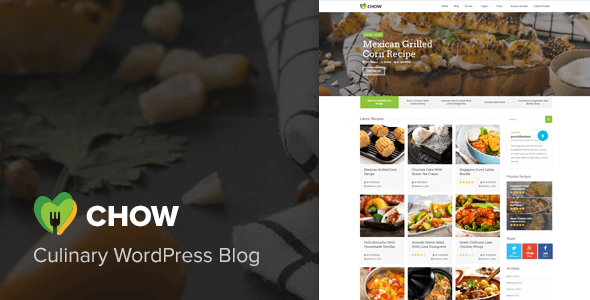 Food blog is compatible with WooCommerce and bbPress, and integrates social sharing options so that your visitors can easily share their favorite recipes. 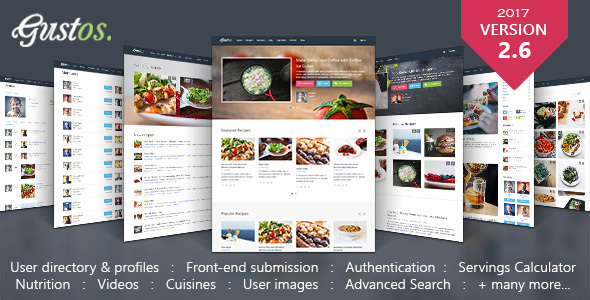 Foodbook is a modern, beautiful, attractive, clean, responsive WordPress food website theme. 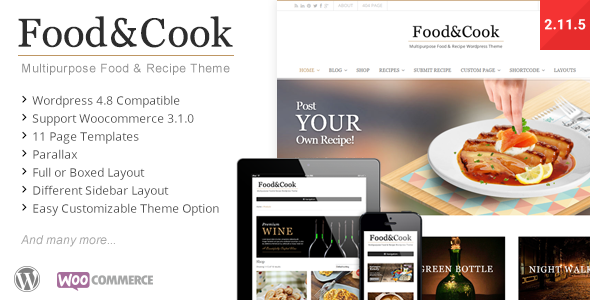 This theme features essential tools and features especially added for cooks and foodies. 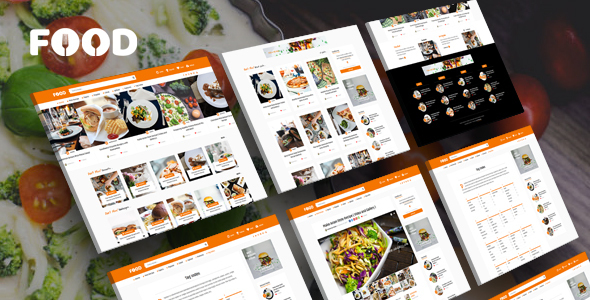 Including a potent theme admin panel along with a drag and drop page builder, Foodbook allows you to create the perfect design for your website. Even if your content will include a ton of images, this theme was optimized to load fast even when that happens. Foodbook is the theme that lets you experience and achieve all you have in mind. Gustos is an elegant, unique, enticing, fresh, premium food WordPress theme. It comes with an impressive set of tools perfect for creating modern and stylish food blogging platforms. The developers behind Gustos have though it out extremely well and you can notice that easily from its features. User can have cooking levels, profile views, reputation score, number of followers, an about section, and more. All the messages sent between users are handled with Ajax, and the site’s member list shows all the current active users. This a great tool for advanced cooking blogs. Try Gustos today asap! 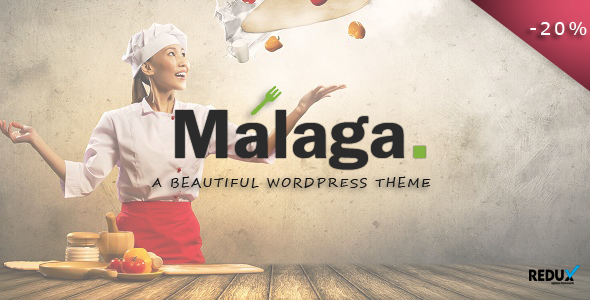 Malaga is a fancy, cool, intuitive, easy to use, responsive, premium WordPress theme suitable for any type of food blog. This theme is responsive and it will look just as beautiful on mobile devices, as it does on desktops. Malaga fully supports RTL, has 5 blog layouts, sticky menu, an impressive slider, unlimited color panel, sticky sidebar, child-theme, and Instagram feed. With this theme you will be able to create stunning pages and list your recipes. I recommend checking out the live preview to see more. 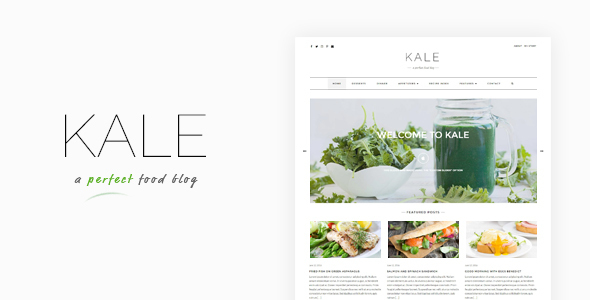 Kale is a clean, minimal, pristine, and responsive WordPress theme built for recipe blogs and cooking bloggers. Kale is designed to look beautiful displaying any type of content, especially food related one. Kale comes with the option to import the demo content, supports video content, MailChimp integration, Instragram feed carousel, a fancy scroll bar, built-in ad spaces, recipe index, front-page banners and sliders, and much more. I recommend checking out the live preview and documentation for more information. Neptune is an expressive, fresh, modern, premium responsive WordPress food blog website theme. Neptune was designed to fulfill all the needs and requirements of food bloggers. All of this theme’s features are incredibly useful, easy to user, and completely necessary. With Neptune a user can search for recipe ingredients, find out a recipe’s nutritional information, review recipes, register and login, bookmark recipes, organize recipes by country, submit your own recipes, and so much more. Expand your blog with this theme. Pico is a simple, warm, appealing, fully customizable WordPress food theme that can be used for cooking and recipe blogs. This theme has awesome design elements and functionality that can be adjusted to guarantee the best outcome for your website. Pico is cross browser compatible, supports RTL, includes a dark skin, has a Google Recipe format, Google maps integrated, and more. I recommend this theme for those who want to keep it simple. Parsley is powerful, clean, visually stunning, professional, and stylish WordPress responsive theme perfectly designed to showcase food related content. Customizing this theme is extremely easy and it requires no previous knowledge or coding experience. Parsley includes 4 unique featured posts layouts, a popular posts section, five past archive layouts, unlimited widget areas, a powerful theme customizer. Whether you are just a passionate foodie or a professional chef, Parsley will make sure your blog outshines the competition. 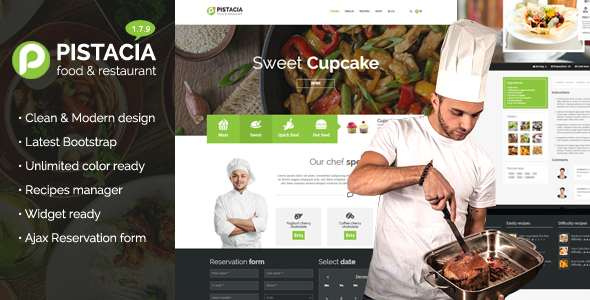 If you want to build a beautiful website, Pistacia is the correct choice for you. This food WordPress theme focuses on content, design, and quality. This theme’s layout is gorgeous, engaging, modern, and will adapt perfectly to all screen resolutions. Thanks to all its amazing niche related tools you will be able to develop create a gorgeous web page. It includes Visual Composer, recipe manager, food menu manager, custom widgets, and WooCommerce. 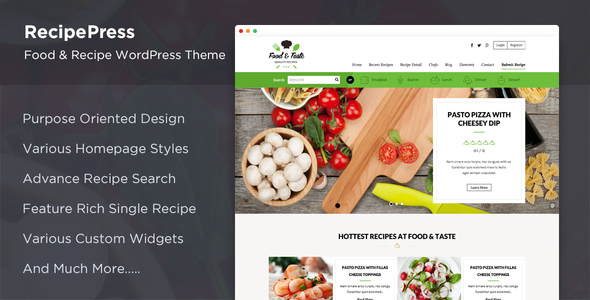 Recipe is a highly customizable, stunning, impressive, and easy to use premium WordPress theme designed for food bloggers. This theme is packed with intuitive tools and elegant design elements. To enjoy this theme you do not have to have previous knowledge about WordPress, or programming. It includes Google rich snippets, an advanced search option, a useful rating system, several specific shortcodes, a full responsive layout, and member profiles. You can truly tailor this theme to fit your vision and style. Quick Recipe is a great choice for those who want a design that overshadows their competition. This theme will allow you to personalize your website however you please and make the best out of it in the process. Given that anyone wants to finish their new website quickly, Quick Recipe comes with the option to import the demo content and have a helpful starting point. After that, setting it up should only take a couple of hours. With Quick Recipe you can truly create a website that matches your style and personality. RecipePress is an elegant, unique, warm, and highly customizable food WordPress theme. This theme provides a great platform for those who like to write about food and share it with others. RecipePress comes with a complete customization panel and options to modify the theme to match your style. It offers 4 distinct homepage demos, over 15 homepage sections, 4 slider variations, recipe listing, news page layout, chef listing, and a contact template. There is no need for coding skills or knowledge to create and deliver professional results with RecipePress! Pluto is bright, intuitive, modern, fancy, and well-structured food blog WordPress theme. With an impressive rating of 4.8, you can easily tell that this theme was designed to exceed all expectations and create beautiful and modern food websites. Pluto is capable of handling anything you throw at it thanks to its impressive tools. It offer user membership features, photo protection for copyright purposes, ad placements, various sidebar and menu positions, 8 post formats, and a unique QR code reader. Pluto is the answer to all your previous problems! Recipes is a food WordPress theme that focuses on cooking and provides adequate features for managing this type of website. This theme is fully responsive, retina ready, and will look amazing on any device, no matter its screen size. This is a premium product that comes with widgets for top rated and recent recipes, built-in rating system, clickable ingredients list, favorite recipes, social sharing option, and ads placements. Your visitors will enjoy a beautiful and unique design as well as easily finding the recipes they need. Get more visitors on your website with Recipes! Tasty food is a creative, impressive, gorgeous, user-friendly, premium responsive food blog WordPress theme. This theme is an awesome solution for anyone who wants to build a modern and stylish blog theme without having to learn programming and web development. Some of the best features of Tasty food are the free installation option, live search, custom widgets, top recipes section, random posts, and social media section. Try Tasty food ASAP, and experience a complete and easy to use theme! Designed and developed by a Power Elite Author, Sprout & Spoon is a successful, attractive, simple, user-friendly food WordPress theme. You can see immediately that this theme was crafted from top to bottom with food recipes blogs in mind. You can immediate access to a bunch of specific features that will help you create the perfect website. There is no need to use all the tools, but you can test and try them out until you find the right thing for your audience. 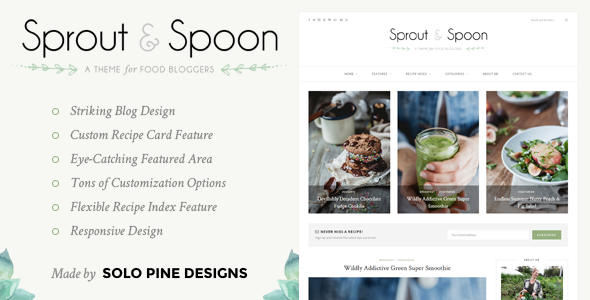 Sprout & Spoon includes a beautiful blog design, custom recipe card feature, a full responsive design, recipe index feature, and a stylish featured area. 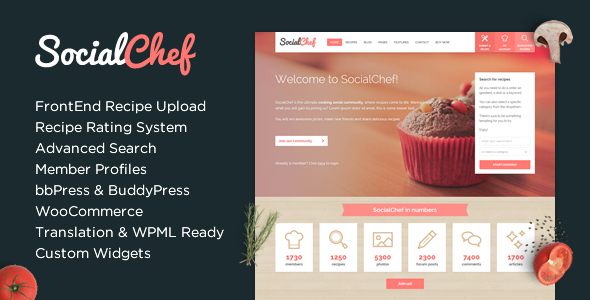 SocialChef is an incredible food WordPress theme meant for this type of websites. You will find it has an advanced integrated search, step by step instructions, rating system, nutrition information, favorite recipes, social media buttons, and featured recipes. SocialChef is also fully compatible with WooCommerce, if you want to turn your blog into an online store. The theme’s layout will adapt perfectly to any devices, screen resolution, and browser. This is a simple, comfortable, and intuitive theme to use. Talisa is a beautiful, eye-catching, user friendly, clean and modern. With this theme is easy to show off your cooking skills and attract more visitors because it offers amazing solutions and options for this specific niche. 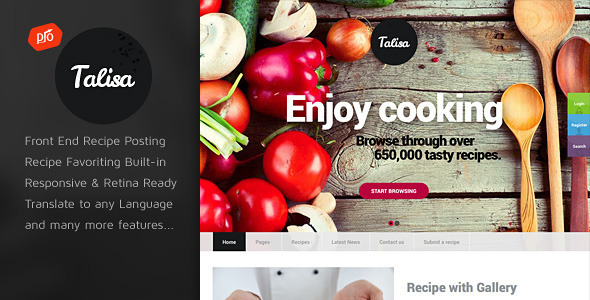 Talisa features the options to bookmark recipes, rate recipes, post recipes, unlimited color panel, translate, import the demo content, and many more. Hiring developers to help design the perfect website is past tense now. Get Talisa! Offer each and every one of you visitors a unique experience and journey with this amazing theme. Sage is the perfect choice for any food related website, because it’s extremely versatile and capable of adapting to any type of content. It uses an impressive number of features and design elements to make your food website a memorable experience for all your visitors. 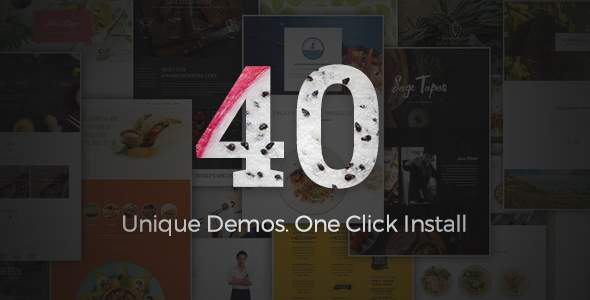 Sage provides 40 stunning pre-built demos, 20 menu pages, more than 80 page elements, 4 addons, 2 header styles and 5 behaviors, integration with Visual Composer, and so much more. Check it out today! 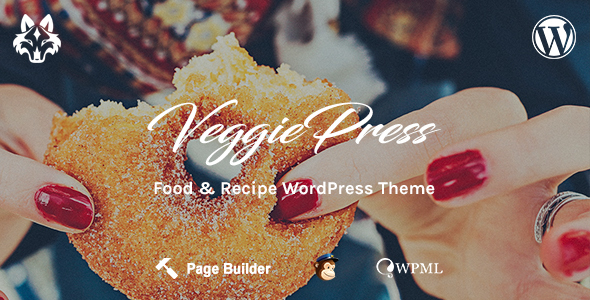 VeggiePress is a clean, astonishing, up-to-date, user-friendly WordPress theme built for food related websites. 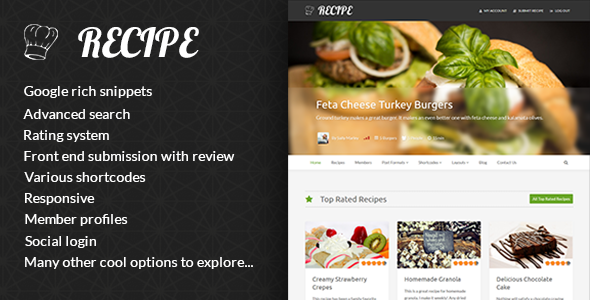 Creating a beautiful cooking website has never been easier thanks to VeggiePress and its impressive features. VeggiePress includes a recipe box, supports Google microdata, an integrated rating system, a powerful customizer, and a potent page builder. Other features worth mentioning are social media features, zoom and parallax effects, and the stunning galleries and slider. You cannot go wrong with VeggiePress! The Kitchen Table is a modern, appealing, robust, clean and responsive WordPress theme ideal for food related websites. Its layout is fully responsive, cross-browser compatible, and retina ready. The Kitchen Table comes packed with straightforward features needed to effortlessly create an engaging website. It has front-end recipe submission, user bookmarking, a powerful theme customizer, various animations and effects, parallax effect, and user layout control. Craft gorgeous websites with The Kitchen Table! 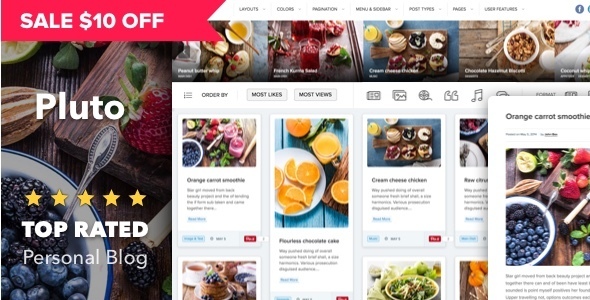 While there are many popular multipurpose themes on the market that could be suited for this niche, this list contains some of the best food WordPress themes specifically designed for recipe and cooking websites. Hope you find the ideal one for you!